It was mentioned by two or three people at closing ceremonies that finding their way around was difficult (even with the maps) and signage would be appreciated. Here's an example of what I think would be a useful sign, designed with it being posted up in the vicinity of Stage Zero. Obviously I'm no graphic designer but you get the gist. I think these kinds of signs has been used before, but have been scrapped because they aren't re-usable because rooms get moved around a lot from year to year. However, since Fanime went so well this year, I don't think a lot of rooms will change anymore. Great suggestion. I also wish there were more maps posted in the public areas. As well as large signs on a stand that cannot be easily stolen or misplaced with Kenji, Spanish, and English directing visitors to the appropriate doors for entry and exit of Dealers hall and gaming hall. Best if the arrows on it are reversible so they can be used in different situations if necessary. When I volunteered at hall 3 I noticed the already small hard to read from a distance signs already went missing the second day. I had to apologize repeatedly when others get confused I feel sorry for them walking so far only to notice its the wrong door. Its really a very long walk if one makes a mistake of which door to go. I think these kinds of signs has been used before, but have been scrapped because they aren't re-usable because rooms get moved around a lot from year to year. I don't think much of Fanime's signs are reusable anymore... every sign I saw was using the current theme. As well as large signs on a stand that cannot be easily stolen or misplaced with Kenji, Spanish, and English directing visitors to the appropriate doors for entry and exit of Dealers hall and gaming hall. Best if the arrows on it are reversible so they can be used in different situations if necessary. Along those lines, I'm wondering why Fanime's signs don't use more symbols to make it clear. Over at Clockwork Alchemy, the design team and Gene Forrer built lamp-posts with signs all over the con. Typical Clockwork Alchemy directional sign. Next year, there should be a few of those at Fanime to direct people to Clockwork Alchemy. Fanime itself needs a different style, of course. I'd suggest the standard Japanese advertising banner. These things are all over Japan. Most small retail stores have at least one. They're easy to make. I've been going to Fanime for 9 years and I stock the forum (probably more then I should) so I know the con center and immediate downtown area like the back of my hand. However, I do recall finding most of the con programming I frequent now just from a process of wandering the con and poking my head in on what sounded interesting. Although the con nowadays is WAY more crowded then it was when I first started attending. I couldn't imaging how confusing and intimidating that would be for a first timer. 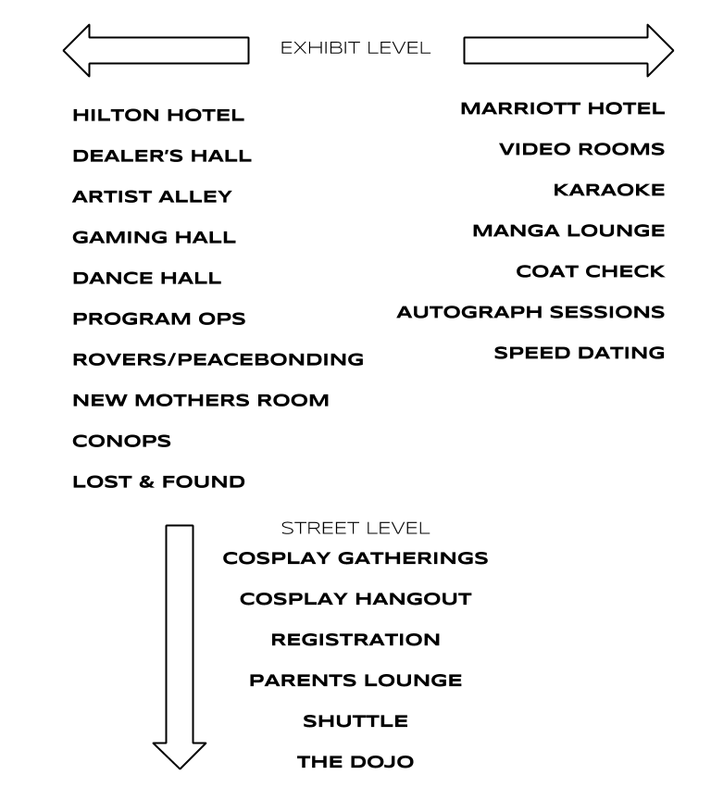 Fanime has grown to the point that the current space is barely enough, and as events need to move farther and farther out to find viable space I think visible signage is going to become all the more paramount to facilitating people's con experience. Girls und Panzer banner, Ōarai, Japan. A Japanese advertising banner in its usual setting - in front of a retail store. Banners like this are about as common as vending machines in Japan. The banner format is traditional, centuries old. The modern advertising version is a cheap mass-produced plastic pole and stand, like this one. Banners usually have bold characters and colors, without much detail. Text usually reads downward, not across. Sometimes you see kanjii down and English across on the same banner. Banners like this would be a nice touch for Fanime. (2) cost of banner vs a printed sign, for some departments this would take up a sizable part or exceed their current overall budget. more maps would be cool, esp. since all the signs are printed every year. Any banner placed outside of or affixed to any of our facilities is subject to a space rental fee. This includes banners bearing only Show Management name or logos, as well as sponsor names or logos. Any sign or banner displayed in a public area of our facilities that bears the name or logo of a sponsor or affiliate partner of Show Management is complimentary. So as long as it says "Fanime" on it somewhere, and it's inside and standalone (not attached to walls, ceilings, or posts) there's no charge. Banners on the Cheap, custom 2x5' banner $12.95. One of many cheap online banner suppliers. Thank you all for the suggestions. We will take your ideas in account when designing our convention message and information campaign.